TAKING FIRE by Lindsay McKenna Q and A today! Check out the above blog today! A Question and Answer about TaKING FIRE and my writing background. Lots of unknown goodies are revealed! Join my newsletter at http://www.lindsaymckenna.com! Give-aways, exclusive material only my subscribers receive. Free, quarterly and fun! TAKING FIRE by Lindsay McKenna and ARABIAN HORSES: What they have in common! There’s a reason why, on the back cover of my book, there is a black Arabian mare. TAKING FIRE front and back cover with black Arabian horse on it. She plays a key role in the book! 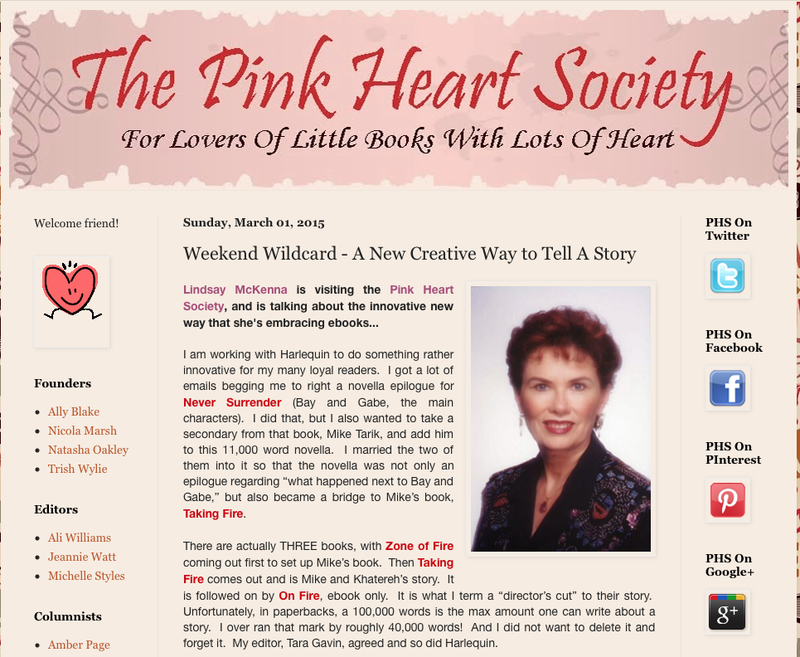 Check out Pink Hearts Blog. I wrote an insightful article for them on TAKING FIRE and the fact that there are actually THREE books involved with this one! A new way of writing! THESE THREE BOOKS ARE INTERCONNECTED WITH ONE ANOTHER. ON FIRE is a 40,000 word sequel to TAKING FIRE and takes the readers to the “next” step in the lives of Khat and Mike. It is ebook only. These three books are all connected! Please let me know if you like this new and different format! Be sure to join my newsletter at http://www.lindsaymckenna.com! Give-aways, exclusive material, latest up-to-date info on my books coming out! Free, quarterly and fun! 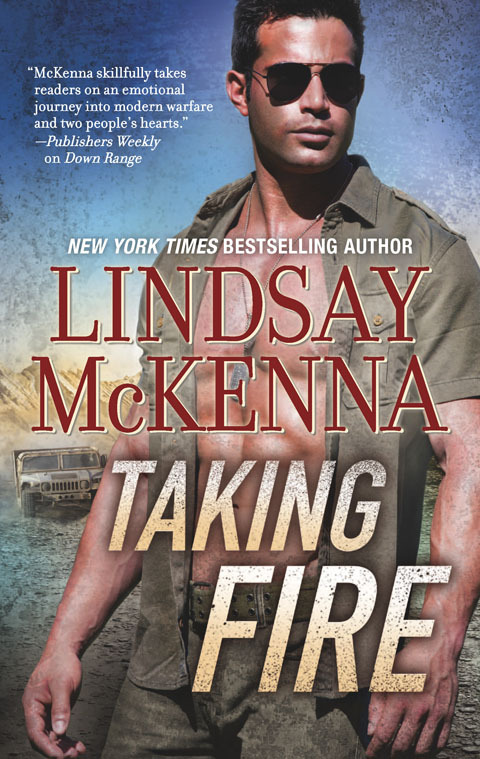 TAKING FIRE by Lindsay McKenna IS AVAILABLE!! February 24th! REVIEW! TAKING FIRE by Lindsay McKenna IS AVAILABLE!! February 24th! In Taking Fire (Shadow Warriors #7) by Lindsay McKenna, Marine Sergeant Khat is a black ops warrior deep in the mountains of Afghanistan. Few know she’s even there. Khat has her own reasons for doing what she does, and she is determined, brave and strong. When Khat spots a small team of SEALs unknowingly headed straight for a Taliban ambush, she gets involved. Despite her handler’s orders not to give away her position, she must take matters into her own hands to save them. Three of the SEALs manage to get to safety, but Mike is separated from them, injured and unconscious. Khat, who has a variety of skills important to what she is doing, rescues him, taking him into the cave she is hiding in. Mike’s awakening in the cave is a touch of humor in the seriousness of Taking Fire, and he is mesmerized by Khat. Scarred mentally and physically from what she has endured in the past, Mike sees beyond all that from the beginning. As he heals enough to be transported back to base, Khat takes care of him and the two of them feel, but don’t act, on their attraction to one another. Khat is focused on her mission, and she doesn’t believe any man will want her anyway due to her past. There is one man who does though…and when Mike Tarik gets back to FOB Bravo, he can’t get her out of his mind. When things start to change up for Khat and she sees more of Mike, she is torn between what she wants, what she feels like she deserves, and her mission. Mike knows he wants to be with Khat…and he’s doing what he can to make that happen. They are both fighting for other people, but will they fight for each other? Or is the burden of what’s happened in the past too heavy for Khat to get rid of and take the chance on change and Mike? Taking Fire is fast paced, was easy to follow and easy to stay involved in. Mike and Khat are great main characters who complement each other even when they don’t realize it. Khat is truly amazing, especially after all she has been through. She is so focused on doing right for others though that she has lost sight of her own self care. Mike sees this and does what he can in a subtle way to help her, but he doesn’t try to strong arm her into doing anything. I liked how he was with her, his understanding even though he was concerned. He wants more with Khat, and he awakens desires within her. Even as the thought of trying to have more with Mike, scares her. They have fallen hard and fast for each other, but Khat is much more cautious. I liked how they tried to work through this, even when Khat just wanted to run away. The attraction and feelings between Khat and Mike happen fast, but they have so many things in common it is completely believable. The setting for Taking Fire is all Afghanistan, and Lindsay gives great insight into military life in a plot that is powerful and very meaningful in today’s world. Lindsay very obviously knows her subject, and this is well portrayed throughout Taking Fire from the romance to the battles they must face in the war torn country. I love how Lindsay writes. Her characters spring to life because of the believability she builds in them and the plot. Lindsay explores cultural differences and what they mean, as well as taking us into the lives of some Afghani’s, which adds a lot of dimension to Taking Fire. The characters in Taking Fire have enough inner conflict to set them apart from other characters in this series, and Taking Fire can be read as a stand alone although I recommend the whole series. The title of the whole series (Shadow Warriors) is so appropriate, especially for Khat and Mike’s story. Written in dual POV’s to take us deep into the characters minds, Taking Fire is a military romantic suspense and I’d recommend it to any romantic suspense reader. Don’t miss these three connected books and ebooks! 1. ZONE OF FIRE by Lindsay McKenna: Ebooks only, all platforms. Catch up with Chief Gabe Griffin and Bay from BREAKING POINT and NEVER SURRENDER…plus, and exclusive peek of a scene from TAKING FIRE! SEAL Mike Tarik is Gabe’s best friend and was featured in NEVER SURRENDER. 2. 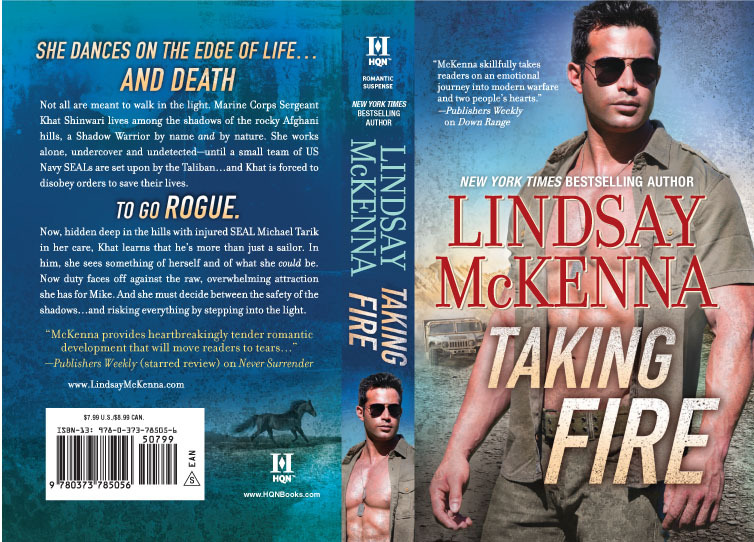 TAKING FIRE by Lindsay McKenna, HQN, 2.24.2015, paperback and ebook, Mike Tarik’s story and how he met USMC Sergeant Khatereh Shinwari, the woman who saves his life. 3. ON FIRE by Lindsay McKenna, HQN, 3.1.2015, ebook only, all platforms, sequel to TAKING FIRE. Find out ‘what else” happens to Mike and Khat! Don’t forget! Sign up for LINDSAY MCKENNA NEWSLETTER!! Free! Quarterly! Exclusive content given only to subscribers. Giveaways! Sign up at http://www.lindsaymckenna.com! TAKING FIRE by Lindsay McKenna BLOG TOUR! February 20th! Join us on TAKING FIRE’s blog tour 2.2-20.2015! Drop by this terrific blog today! Last day of a blog tour for TAKING FIRE! Thanks for coming along. Please SHARE with your friends! Review of the book plus a quote and sentence from the book! And, there is a $100 Giveaway, so sign up for it!! Take time to drop by these blogs for lots of behind-the-scenes intel that you will find nowhere else on the Net! TAKING FIRE by Lindsay McKenna BLOG TOUR! February 19th! Drop by these terrific blogs today! TAKING FIRE by Lindsay McKenna BLOG TOUR! February 18th! Author spotlight on TAKING FIRE, an in -depth interview giving you new, unknown information about Khat Shinwari and Mike Tarik. get the story behind the story of how Lindsay created it! Read an article “Horses and Their Role in TAKING FIRE and the Middle East” by Lindsay McKenna. She owned an Arabian breeding farm in Ohio and has featured these incredible horses in this book. 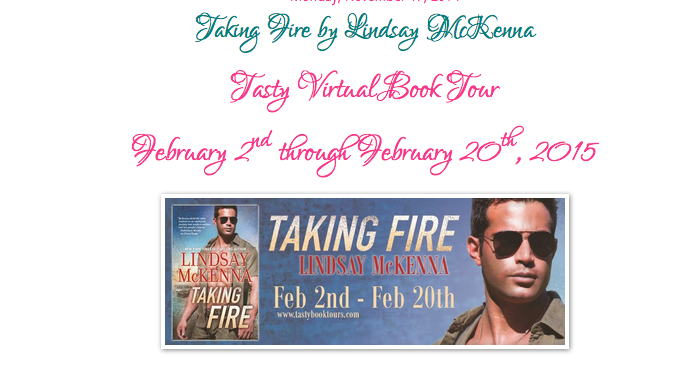 TAKING FIRE by Lindsay McKenna BLOG TOUR! February 17th! Drop by this terrific blog today! TAKING FIRE by Lindsay McKenna BLOG TOUR! February 16th! Drop by these terrific blogs today!. Quote Image #14 along with a sentence from TAKING FIRE. Don’t miss this! Don’t forget! Sign up for LINDSAY MCKENNA NEWSLETTER!! Free! Quarterly! Exclusive content given only to subscribers. Giveaways! Sign up at http://www.lindsaymckenna.com! Next issue is March 1, 2015! TAKING FIRE by Lindsay McKenna BLOG TOUR! February 14th! Valentine’s Day! Drop by these terrific blogs today! Exclusive article on my bookcases and the books I use when writing a story. Don’t miss this! 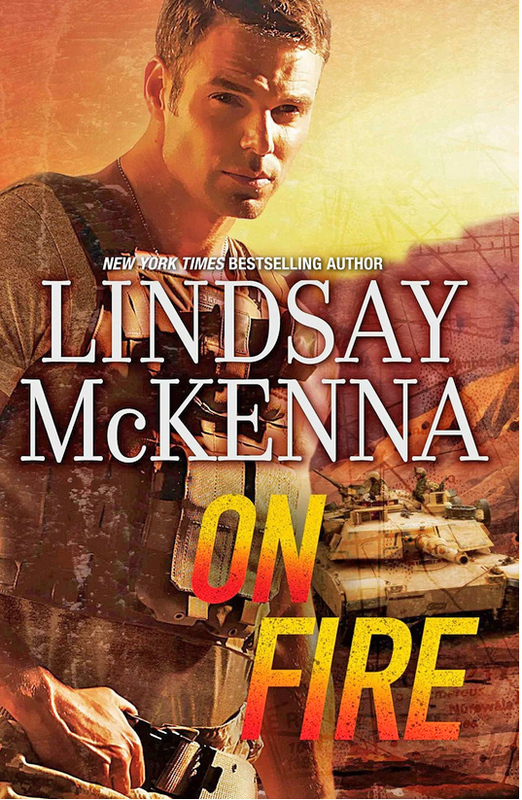 guest post by Lindsay McKenna on the sequel to TAKING FIRE, ON FIRE, 3.1.2014. A Valentine’s Day special post about the main characters! You are currently browsing the archives for the Taking Fire category.